Lacquered Geek: Gradient using Lucky 13 Lacquer "Flops"
This is going to be short and sweet because I am dealing with a kitty that doesn't feel well. If you follow me on Instagram, you have seen our little monkey cat. We took him to the vet on Sunday, and then again today. If he's not better by Saturday, we have to take him back. We have to give him subq fluids for the next two days, and do lots of hoping and praying every time we check his litter box. So far, I've only watched the vet give him the fluids, so I haven't had to do it myself yet. I'm nervous but it has to be done. I'll do anything for that lil' kitty! Okay, so on to my nails... 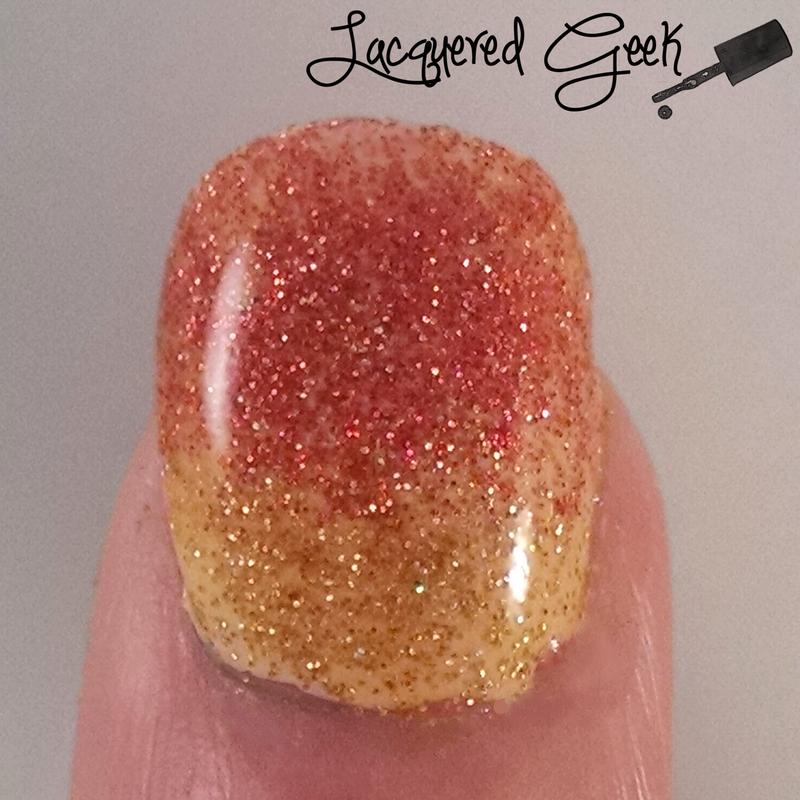 I've got a quick gradient that I did with a couple of "flops" that I've recently purchased from Lucky 13 Lacquer. Sometimes the "flops" aren't what she had in mind, or just aren't up to full release standards... but they are always gorgeous! I picked up several during the latest flop restock, and as soon as I looked at Fire Opal (red-orange) and Citrine (mustard yellow), I saw a gorgeous gradient in the making! I started with a base of white, and I wish I'd started with Citrine instead. I thought Citrine would be too sheer to start with. The white didn't want to behave, and for some reason long after the white base on the other fingers was dry, my pinkie was a gloopy mess. Of course I didn't notice this until I started sponging on the gradient. My pinkie ended up being one hot mess. I was able to savage it a bit. 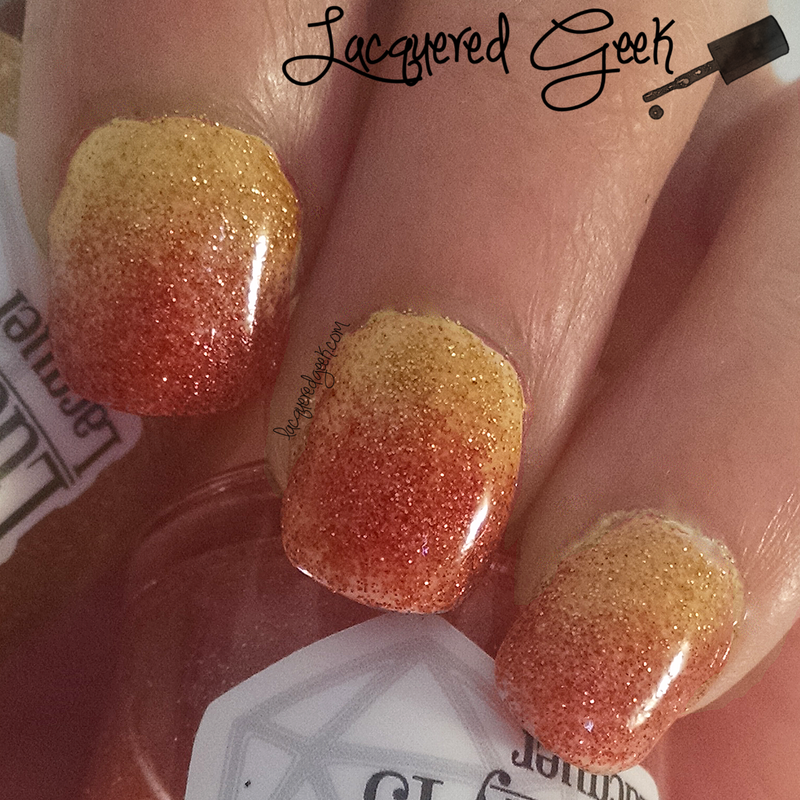 I sponged two coats of Fire Opal and Citrine over the gloopy white base. Fire Opal and Citrine were just perfect. They put that white base to shame! Both polishes also glow in the dark, but sadly my camera battery was dead, and my phone wouldn't pick up the glow. But it was lovely! There are currently a handful of flops left in the Polish Orphanage, and are $5.00 a bottle. 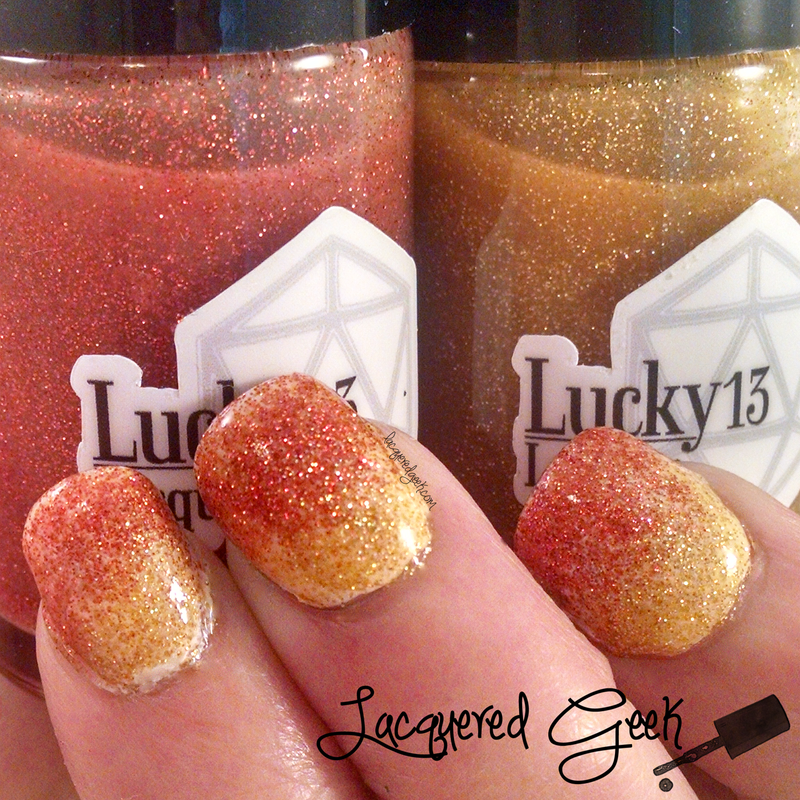 You can follow the Lucky 13 Lacquer Facebook page to learn when new "flops" are added to the Polish Orphanage. Do you like when makers release their "flops"? Do you have any of them?